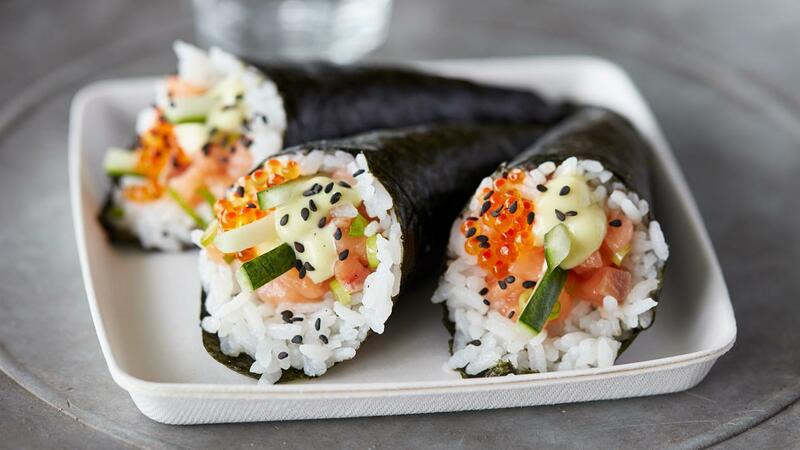 Japanese rice cone with fresh salmon, pickled ginger, cucumber and wasabi mayonnaise. Put the cone together by starting with a rectangle shaped sheet of seaweed. Use cooked sushi rice that’s seasoned with rice vinegar. Add the rice in a thin square layer onto the seaweed. Add fresh salmon chopped into small cubes together with pickled ginger and cucumber strings. Fold the sheet in a cone shape. Finish the roll with wasabi mayonnaise, spring onion, black sesame seeds and trout eggs.